More than Hollywood starlets, bronzed skin and bikini-clad bodies, Los Angeles is a hub for everything creative and inspiring. From the music and movies to the clothes and food, L.A. has an energy and promise it's impossible to duplicate. This is a great place for dreamers and go-getters. Different areas of the city are like separate villages with their own distinctive personalities and our selection of the best places to stay in Los Angeles reflects this. Head out to Venice Beach and sunbathe under the electric blue sky, beside a bikini-wearing 60 year old with skin like a handbag. Cruise up and down the beach a few times, then dodge bodies up to the boardwalk where you might catch the next big thing in music, magic or street performance - all for free! Yes, in L.A. the inexpensive sits comfortably beside the expensive. Little old delis and hot dog vans beside super clubs and Michelin starred restaurants. Markets beside big brand boutiques. Museums beside cinemas - but then this IS L.A.. Here you'll find plenty of sunshine, plenty of preening, but also plenty of fun. Some of L.A. takes itself too seriously, but that's one of the reasons why it's so much fun for the rest of us! Taken one at a time, the bits of this metropolitan jigsaw seem friendlier, more appealing to explore and easier to get to know and it is worth putting almost as much thought into where you want to be based as which hotel you want to stay in. 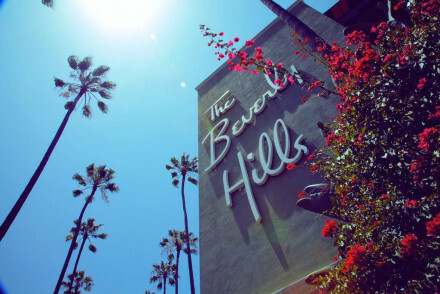 Top choices for the best places to stay in Los Angeles are the newly revamped Hollywood with its film studios and Walk of Fame, Beverly Hills with its shops and the Santa Monica and Malibu beach areas. Wherever you decide to stay, there is easy access to other areas and no shortage of things to do. From celebrity spotting, visiting Universal Studios, the huge Griffith Park or the Getty Center, checking out the vibrant nightlife or just watching the spectacular Pacific sunsets. Hit Venice beach for a day under the sun amongst the hip crowds. Visit the Griffith Observatory and enjoy the far stretching views across the city. Stroll along Rodeo Drive and ogle at the high end stores. Stop by the iconic Santa Monica Pier and Beach and take one of the fair rides. Be sure to spend a day in Universal Studios Hollywood. 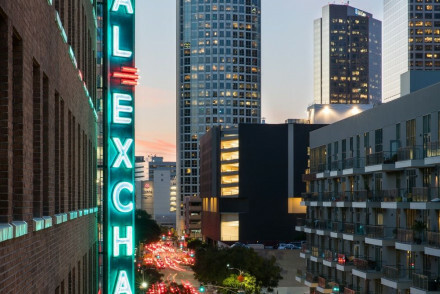 Such a fantastic city with something for everyone means that many of the best places to stay in Los Angeles are quickly snapped up, so to be sure of your booking make plans and book soon. 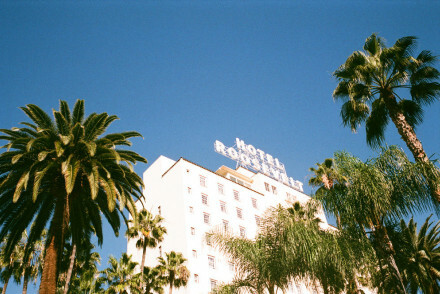 For a proper Hollywood experience one of the best places to stay in Los Angeles is the Hollywood Roosevelt. 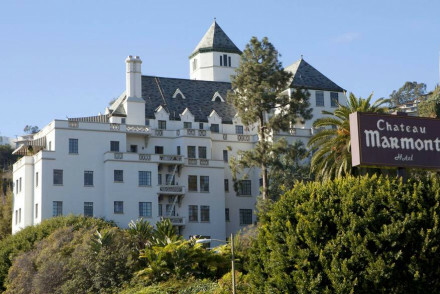 This hotel hosted the first Academy Awards ceremony in 1929, and was a favourite of big name stars like Marilyn Monroe and Clark Gable. Plenty of the original 'Spanish Colonial' style remains but with a modern take added during the hotel's complete restoration in 2005. 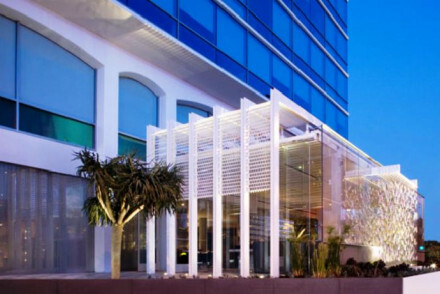 The Mondrian is another re-vamped Hollywood classic, close to Fox Studios, Paramount Pictures, Rodeo Drive and the Getty Museum. The vibe is Californian low-key. Gorgeous Art Deco icon, Sunset Tower, was once the Hollywood address. 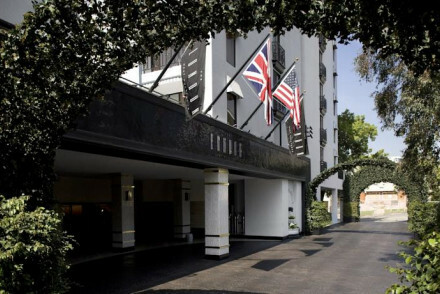 Errol Flynn, John Wayne and Marilyn Monroe were all residents during its glorious heyday as an apartment building. A careful restoration has retained all the charming details and has added all the 21st Century essentials, including a spa and restaurant. For something a bit different try Château Marmont. Because this is Hollywood you might think it is a set, but no, this wonderful reproduction of Château Amboise is a hotel. To match the setting, the cuisine is gourmet and favoured by A-listers. 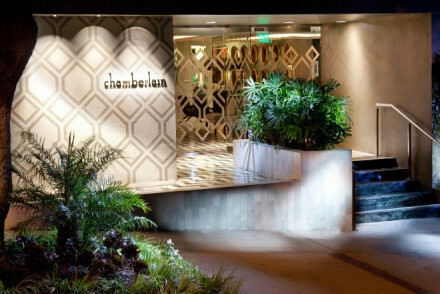 The Chamberlain West Hollywood is a striking suites-only hotel in the heart of West Hollywood and has a rooftop pool and terrace with spectacular views of the Hollywood Hills and downtown LA. The Charlie is a unique set of 13 standalone cottages. 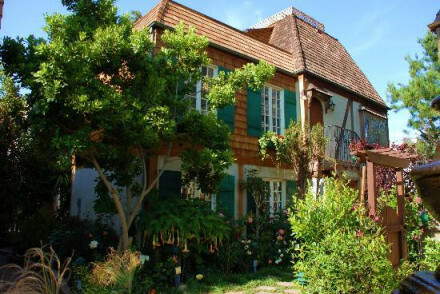 Once home to Charlie Chaplin and friends such as Marilyn Monroe, minutes from Sunset Boulevard. 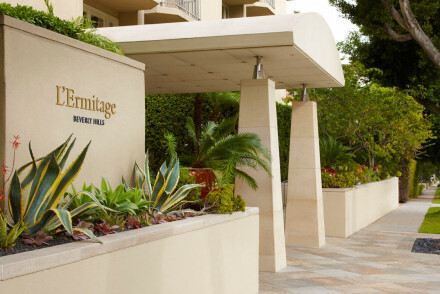 Eccentric suite-only hotel just off Santa Monica Boulevard, Petit Ermitage offers a rooftop pool boasting spectacular views of LA. 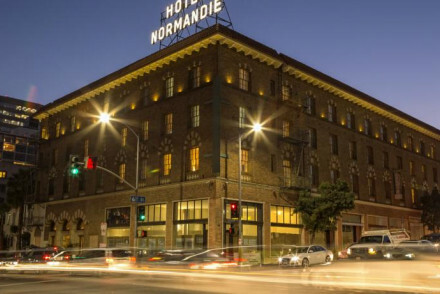 For the museums - Central L.A.
For something fun and inexpensive in a super central location, try the Farmer’s Daughter, a 'farm' themed hotel with crowing alarm clocks, denim duvets and inflatable farm animals in the pool. For shopping - Beverly Hills! 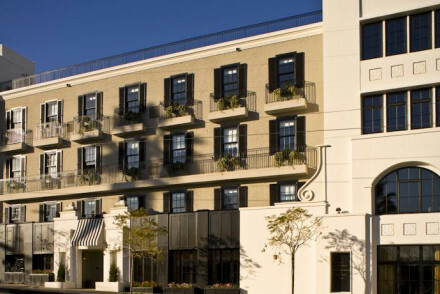 The Avalon's name might not be familiar, but as the Beverly Carlton this boutique hotel has been an L.A. institution since the 1950s. 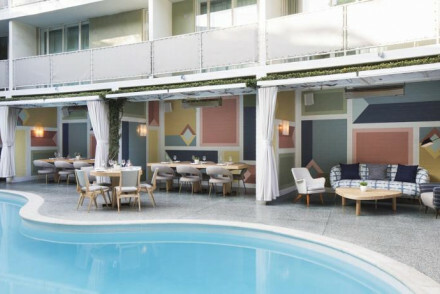 They've kept the 50s, patio chic style - this is one of the best places to stay in Los Angeles if you're looking for a taste of vintage glamour or Mad Men chic. Expect excellent food, a long cocktail list and furniture by George Nelson and Charles Eames. 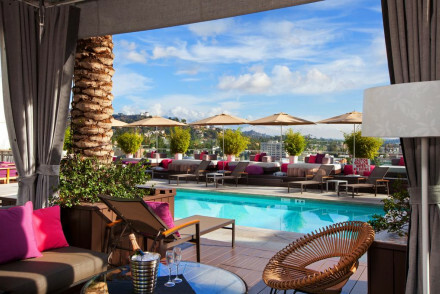 If you're looking for sleek and smart, with the kind of roof terrace made famous by music videos, book the Thompson, Beverly Hills. Only a few blocks from Rodeo Drive, you're right in amongst the action, and you can see it all happening from, and on, the roof terrace each evening. 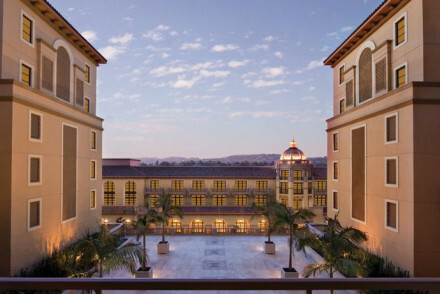 Check into the Montage Beverly Hills if you're looking for real Rodeo Drive opulence. 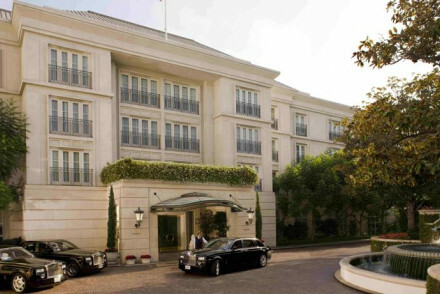 Just back from 'the drive', this hotel has its own boutiques and a 20,000 square foot spa. 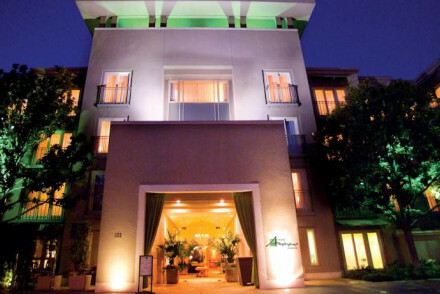 The Viceroy is a glossy beachside hotel with sea views, a colonial atmosphere and cutting edge design. 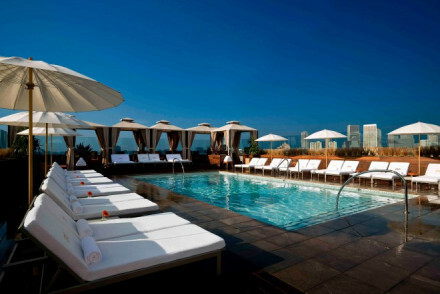 Shade Hotel is a sophisticated hip property with cutting edge monochrome designs, just off Manhattan Beach. 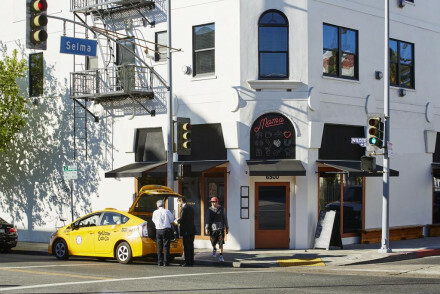 The Mama Shelter, Los Angeles is a 1930s gem that sits between Sunset and Hollywood Boulevards and welcomes all. Rooms are supplied with hi-tech kit and offer city views, while the beds are luxuriously comfortable. 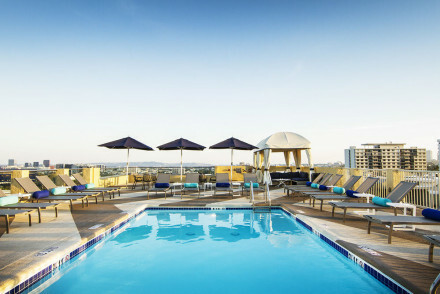 In the heart of Burbank, Amarano Burbank, is a contemporary hotel offering rooftop views of LA, in-house dining and areas to relax by the pool. 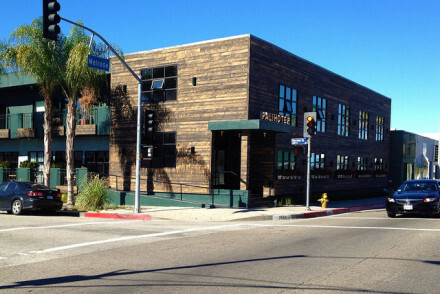 The Palihotel is located in the heart of LA. This contemporary, intimate boutique hotel is for nightlife lovers, city explorers and food enthusiasts. 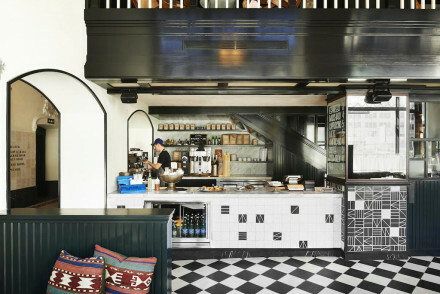 The Kinney is a hip hotel boasting a Venice beach address. Vibrantly styled rooms feature bright colours, clean lines, contemporary art and luxury bathrooms. 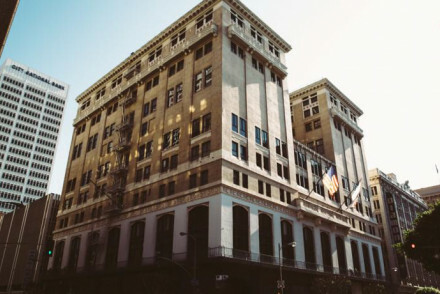 The trendy Ace Hotel Downtown is in the renovated United Artists Tower in the heart of LA. The rooms blend contemporary minimalism with hipster-chic features, prioritising comfort and character with luxury. 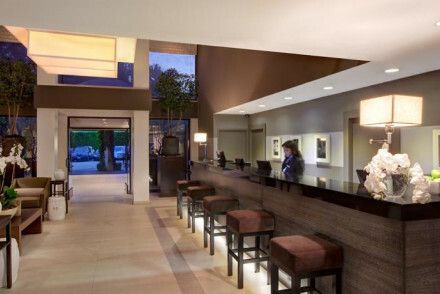 Luxe Hotel Sunset Boulevard sits in 6 acres of Brentwood Park and on Sunset Boulevard this contemporary, brilliantly situated hotel has its own spa, gym and outdoor pool. 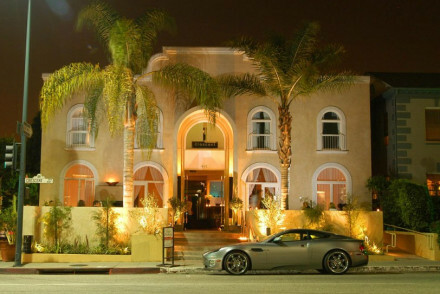 Le Montrose Suite Hotel is a state of the art luxury hotel just around the corner from Sunset Strip, West Hollywood. Contemporary chic rooms feature stylish furnishings, comfy beds, expansive seating areas and funky fabrics. 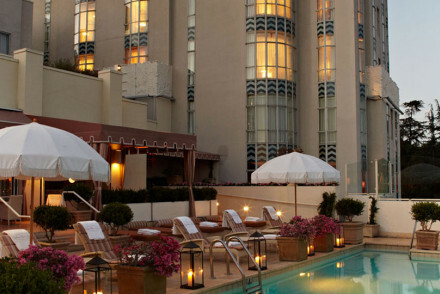 Sunset Tower Hotel is a1929 Art Deco apartment block in prime location on Sunset Strip. Formerly home to Marylin Monroe and Frank Sinatra, this chic and contemporary hotel has pool, spa, restaurant and a lively bar. 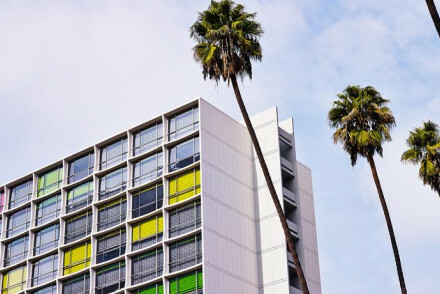 Mondrian is a revamped famous Sunset Boulevard hotel in Hollywood. Avant-garde interiors have been replaced with a low key refined Californian vibe. Skybar on the roof is a notorious destination. 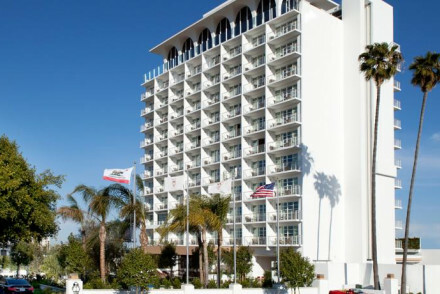 Inn at Playa del Rey overlooks the waters of Marina del Rey and the Ballona Wetlands. The decor is casual and effortlessly elegant, with a lavish twist. 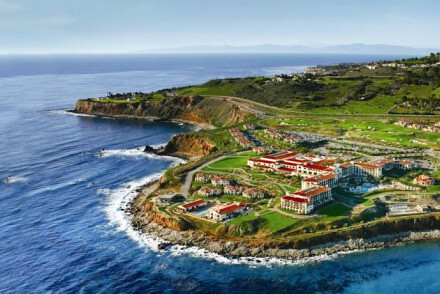 One feels totally pampered with a gourmet breakfast each morning, Californian wine and hors d’oeuvres every afternoon. The Line Hotel is a modern hotel with spectacular views in Koreatown, known for its high concentration of restaurants and bars. The Los Angeles area is served by five major commercial airports - Los Angeles, Burbank, Santa Ana, Long Beach, and Ontario. Best time to visit - Los Angeles is a year round destination with ambient temperatures year round however Spring, between March and May, and Autumn, between September and November, are ideal if you are looking for fewer crowds. Browse through our list of all the best places to stay in Los Angeles. Widen your search to include all our recommendations in California. 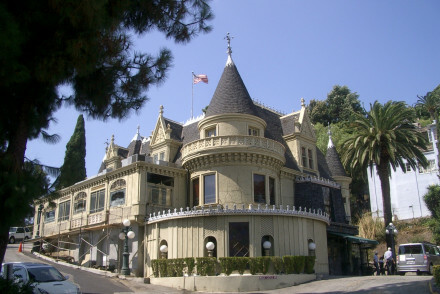 A Hollywood icon, not for its hotel but for its "Magic Castle". The secret hideaway, almost impossible to access, unless you're with a magician or you stay at the hotel! 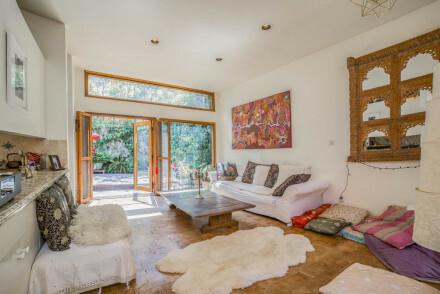 The property itself is unremarkable, but is excellently located and includes a pool - gold dust in the heart of town. 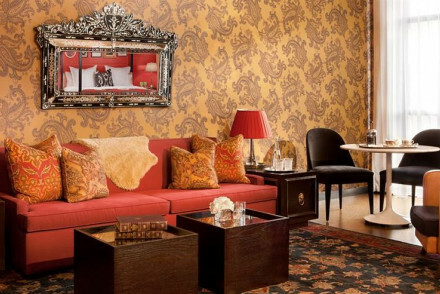 Housed in a downtown private athletic club, dating to 1880, this urbane hotel will not disappoint. The decor is sophisticated, classic yet modern. Members only athletic facilities, restaurants and bars lend a touch of class. Glamorous, grown up and chic. Great walks - Los Angeles Conservancy Walking Tours and Downtown LA Walking Tours run regularly throughout the day. Sights nearby - TCL Chinese Theatre, a cinema palace on the historic Hollywood Walk of Fame, is only 15 mins away. Swimming Pool - Year round indoor pool. 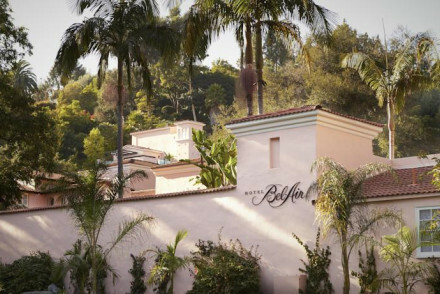 A spiritual escape in glitzy Bel Air, owner Hedda has a refreshing approach to luxury. This tranquil four suite B&B is the perfect sanctuary for weary travellers. Rooms are decorated in colourful hues with incense sticks, candles and epsom salts in the bathrooms: everything you need to unwind. Located in downtown LA, Freehand is the ideal city break. The hotel's decor features plenty of wooden influences, light hues and colourful artwork adorning the walls. Come back after a day sightseeing and relax in the outdoor pool (boasting 360-degree views) or the cocktail bar. A top-notch stay! State of the art luxury hotel, just around the corner from Sunset Strip, West Hollywood. Contemporary chic rooms feature stylish furnishings, comfy beds, expansive seating areas and funky fabrics. Centrally located for all L.A. has to offer and with a rooftop saltwater pool to boot! Opulent and fun! Great walks - Explore West Hollywood’s 1.9 mile stretch of Historic Route 66, an inspiring walking exploration of Los Angeles culture. Sights nearby - One of California's most exciting theme parks, Universal Studios is located just north of downtown Los Angeles. A fabulous 1920's Neo Classical building housing a cutting edge on trend hotel by New Yorks NoMad. The interiors echo the grand ballroom ceiling in the foyer- a masterpiece of gold, blue and white. There are numerous dining options and the rooftop pool and bar draw a lively crowd on the weekend. Young fun hotel, popular with a creative crowd W Hollywood is but moments from the iconic Hollywood walk of fame. A chic, modern option providing a rooftop pool, 24 hour gym and Bliss spa. Delphine restaurant serves up modern Californian dishes whilst the Living Room shakes up great cocktails. 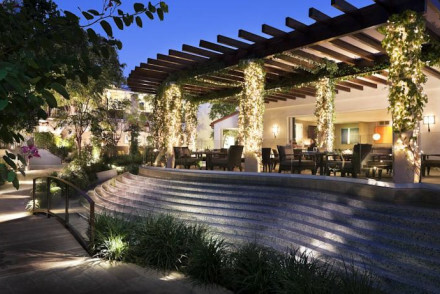 This luxury, contemporary hotel is in the heart of Beverley Hills with spa, pool, fitness and business facilities. Natural light floods the large, modern rooms. Balconies and marble bathrooms are on tap. 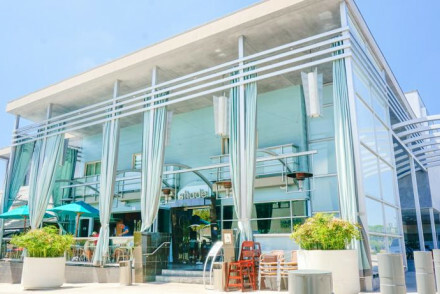 With Mediterranean cuisine or a more casual affair at the roof garden. The world is your oyster! Sights nearby - Griffith Observatory for telescopes, planetarium and views of LA. Fishing - Head to Santa Monica pier. An icon. Countless famous faces have graced its corridors; and it remains a place to see and be seen. Sprawled across twelve acres of tropical grounds guests needn't leave. From fine dining at The Polo Lounge to 1950s glamour at the Fountain Café or poolside lunches at Cabana Café. An utter treat. Writing a novel - Or a screen play... Plenty have been written here already!